Diabetic retinopathy is a complication of long-term diabetes resulting from changes in the blood vessels of the retina. The condition may start with no symptoms or only mild vision problems, but it may eventually lead to blindness. Diabetic retinopathy is the leading cause of blindness in working-age Americans. The longer a patient has diabetes, the greater the risk he or she will experience diabetic complications such as diabetic retinopathy. Preventive measures include maintaining well-controlled blood sugars and regularly scheduling eye exams. Poorly controlled blood sugars may affect the capillaries in the eye. If a patient is admitted with diabetic retinopathy or has retinopathy due to diabetes, the diabetic code (ICD-9-CM category 250) must be sequenced as the principal diagnosis followed by the code for the specific type of retinopathy as a secondary diagnosis. The physician must state a cause and effect relationship between the retinopathy and the diabetes before the retinopathy can be coded as a diabetic condition. • 3: type 1 (juvenile type), uncontrolled. Documentation of diabetes being “out of control” is equal to uncontrolled diabetes. However, “poorly controlled” diabetes needs further clarification from the physician. If the term is not further clarified, it defaults to controlled diabetes. • proliferative retinopathy (362.02): involves abnormal growth of new (but weak) blood vessels in the retina. If a patient with diabetic retinopathy is experiencing macular edema, then code 362.07 is assigned along with the appropriate code for the retinopathy. If the severity of nonproliferative diabetic retinopathy is not specified, assign code 362.03. Diabetic retinopathy not further specified is classified to code 362.01. A patient may not experience symptoms in the early stages of diabetic retinopathy. As the disease progresses, the patient may experience floaters (spots floating in vision), blurred vision, gradual vision loss, fluctuating vision, shadows or missing areas of vision, poor night vision, impaired color vision, and vision loss. The condition does affect both eyes. Diabetic retinopathy is diagnosed with a dilated eye exam. This exam can identify cataracts, abnormal/leaking blood vessels, macular edema, fatty deposits in the retina, scar tissue, new blood vessel growth, vitreous hemorrhage, retinal detachment, and a damaged optic nerve. Fluorescein angiography and optical coherence tomography also may be performed to help diagnose diabetic retinopathy. Treatment of diabetic retinopathy depends on the stage and severity of the condition. Nonproliferative diabetic retinopathy may not need immediate treatment but will require close monitoring. Good blood sugar control can slow the progression of diabetic retinopathy. Proliferative diabetic retinopathy may require focal laser treatment or photocoagulation, which stops or slows the leakage of blood and fluid in the eye; scatter laser treatment or panretinal photocoagulation, which shrinks abnormal blood vessels; vitrectomy, which removes scar tissue and blood from the vitreous; or repair of retinal detachment. 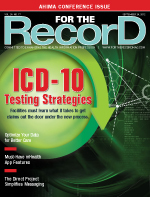 Coding and sequencing for diabetic retinopathy are dependent on the physician documentation in the medical record and application of the Official Coding Guidelines for inpatient care. Also, use specific AHA Coding Clinic for ICD-9-CM and American Medical Association CPT Assistant references to ensure complete and accurate coding. • Assign an additional code to identify the stage of glaucoma when the types of glaucoma classified to codes 365.1 to 365.6 are documented. A code identifying the glaucoma stage (365.7) may not be sequenced as the principal diagnosis. • Bilateral glaucoma that is the same type and stage is assigned to one code for the type of glaucoma and one code for the stage. • Bilateral glaucoma of different types and stages in each eye is assigned to one code for each type of glaucoma documented and one code for the higher glaucoma stage documented. • Assign the code for the highest stage documented if the stage progresses during the admission. • If the stage of glaucoma cannot be clinically determined, code 365.74 is assigned and is based solely on clinical documentation. Glaucoma stage unspecified (365.70) is assigned when there is no documentation regarding the stage of the glaucoma. • 4: indeterminate stage (used based on the clinical documentation when stage cannot be clinically determined). If a patient is admitted with glaucoma and the stage progresses during the admission, assign the code for the highest stage documented. Assignment of the seventh character 4 for indeterminate stage should be based on the clinical documentation. The seventh character 4 is used for glaucomas whose stage cannot be clinically determined. Unspecified stage of glaucoma is used when there is no documentation regarding the stage of the glaucoma.